Baden Bath’s DVD tub is the ultimate in luxurious bathing relaxation. Imagine soaking away your stress alone or with someone you love in a Baden Bath DVD tub. You can watch your favorite movie, listen to relaxing music, and enjoy cold beverages while you enjoy the relaxation of a multiple jet whirlpool bathing experience in your own home. The incredible Baden Bath DVD tub features a flat panel television screen which folds down, a DVD player, a CD/AM/FM stereo system with dual remotes, and is even equipped with a cooler for wine or your favorite beverages. The tub also features ten whirlpool jets and a heater to keep the bath water hot for the duration of your bathing experience. What could possibly be more enjoyable than a warm soothing soak with a cold beverage in this delightful tub at the end of a hectic day? The entire line of Baden Bath tubs includes heaters and self-cleaning functions, and all fixtures are included. The faucets are crafted from solid metal and have ceramic settings. Customers may select from chrome, brushed nickel and oil-rubbed bronze faucets to coordinate with their existing bathroom decor. You can own a Baden Bath DVD tub for $11,600 and enjoy the luxury of having a private spa retreat in the privacy of your own bathroom. Baden Bath specializes in providing the highest quality and most luxurious bathroom items available. Baden Bath’s design philosophy combines beauty and style with European craftsmanship, providing the ultimate luxury in in-home rejuvenation for customers. The company prides itself on creating products that represent outstanding quality, finishing and workmanship. In addition the DVD tub, the company also offers luxurious sauna and showers systems, vanities, sinks, and toilets. All parts necessary for installation are included with the purchase of a Baden Bath DVD tub. Additionally, the company provides installation experts at no cost to assist contractors and plumbers with installation of Baden Bath products. 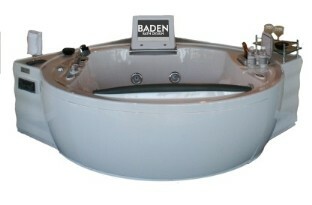 The Baden Bath DVD tub is backed by a two-year, full replacement warranty, as are all products in the Baden line. Are you ready to bathe in luxury with a Baden Bath DVD tub? Visit the retail outlet in Cool Springs, Tennessee, or visit BadenBath.com to view the online showroom or to request additional information. The complete line of Baden Bath products can be shipped worldwide from the company’s supply, distribution, and shipping center are located in Nashville, TN. Additional retail outlets are scheduled to open during 2007 in Birmingham, AL and Rockville, MD.